“How do you store your recipes?” is a topic I frequently see on food forums and one that I will always click on. Stationery and organisation are two of my favourite things and I’m fascinated by how people deal with their recipe collection. I have a very simple system that works well for me but it does require constant attention. I have a ferocious appetite for anything to do with food and am a fiendish collector of recipes. Unfortunately, I don’t often save just the recipe I’m interested in but generally throw the magazine or newspaper into a pile where it will sit until I can no longer close the cupboard or drawer the pile is currently residing in. Working my way through that pile is a long and laborious job that I hate and will always put off in favour of something else. With a little time on my hands this week though, I finally got round to dealing with large, wobbly pile and was left with just a small collection of recipes/ideas that I have now filed away and can use effectively. I have a box file that is organised into sections: meat, fish, vegetables, dessert and miscellaneous. The miscellaneous file is separated further into: starters, sides, sauces and family recipes. There’s another file for “things to make soon” which is a collection of things I’ve pulled from the wider folders and is suitable for the current season/suits my current mood. When planning meals, this is the folder I go to first. Of course, on top of that there are the recipe books that I buy obsessively but rarely cook from, the electronic files that live on each of the three computers we have at home where I’ve copied and pasted stuff or scribbled down ideas depending on which machine I happen to be using at the time. Each of those machines also has a long list of bookmarked items that I’ve come across and saved for a later date. Finally, I also have various notebooks full of ideas: one in my handbag, one next to the bed, one in the kitchen and several other dotted around the flat. I’ve made some progress with the electronic stuff and have utilised Google Docs as a central repository for bookmarked items. Now, regardless of which computer I happen to be using at the time, the plan is to store everything here. This is taking a while though and I still have a lot to get through. I haven’t even started with the notebooks but the ultimate plan is to just have one book that’s divided into sections, similar to those I use for the paper-based recipes, that I carry with me and use at home. Once I’ve cooked something then I generally blog it and can find the recipe here, via the search facility and then, if I want to cook it again, I can take the laptop into the kitchen (although I’ve been thinking recently that an iPad would be perfect for this). The next step is remembering/forcing myself to actually discard the original clipping once I’ve done that though otherwise the paper-based filing system becomes unwieldy. I find it very difficult to get rid of recipes that I’ve snipped from magazines even if I’m no longer interested in it or have actually cooked it and typed up the recipe elsewhere. I still haven’t managed to get rid of some of the very first clippings I saved years ago, even though in many cases I now own the book the recipe actually comes from. Nostalgia, sentimentality and a tendency to hoard are facets of my personality that don’t really co-exist with my love of tidiness and organisation but I’m working on it. Anyway, the point of all that is, now that my filing systems are in better shape, working out what to eat today was much easier and this recipe came was found easily in the meat section of the box file. What I do need to remember to do is write down the source of the recipe since I don’t know where this originally came from, it does look a lot like an Olive or Delicious typeface though. I should also put the clipping into some kind of wipeable folder before I take it into the kitchen too, otherwise it ends up grease-splattered like the one you see above. 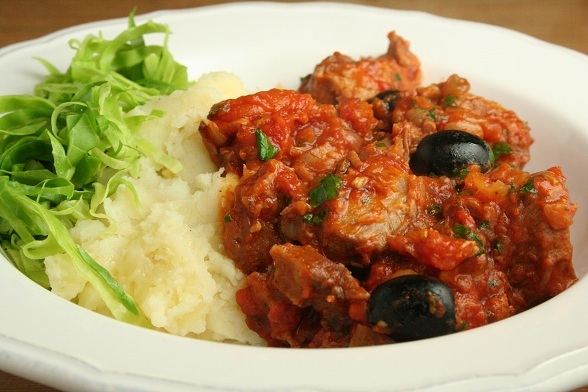 This wasn’t bad but could do with some modifications, perhaps some stock would help, less tomatoes and definitely more olives, lemon zest and parsley. I was going to type the recipe up so I could recycle the original clipping but it’s quite clear from the picture what the ingredients and method are so I don’t think I’ll bother. I will do the recycling though. 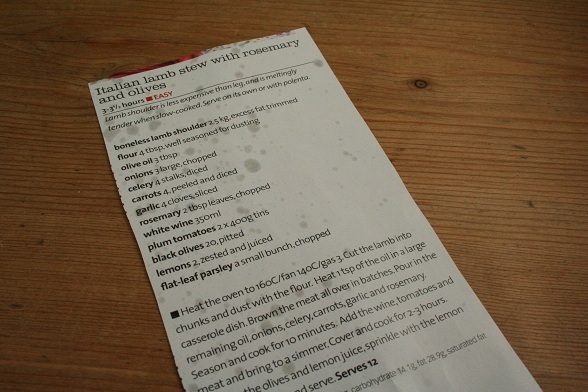 Subscribe to comments with RSS	or TrackBack to 'Italian Lamb Shoulder and Recipe Organisation'. Looks like Olive to me! I am exactly the same and hate throwing away my clippings even if I have blogged the recipe. Ridiculous hoarding. It is ridiculous, GC, it stops now! I even keep the magazines when I don’t particularly want to cook anything out of them…. It really is getting stupid. But you never know when you might need them! Yeah, I’ve just realised I do that too Emily 🙁 I’ve imposed a complete ban on all food magazines until I get this under control. Oh, but the new Olive is really good! Lots of lovely fishy recipes… I’m not helping, am I? I have gone to using Microsoft Onenote on my little ntebook PC. It works great! I paste the recipe (it also pastes a link back), I can put in pictures or what ever, then I tag them with things like family favorite, and I can search within Onenote. Great program and my little netbook fits nice ontop of the microwave and usualy only gets flour on it. Thanks for making me feel better about my ‘collection’. I don’t have my grandmother’s books sadly but it’s a lovely thing to pass down the generations. I did actually start writing recipes up but I keep them all here anyway so there didn’t seem much point. I did consider Onenote, lots of people have told me it’s good but I’m more familiar with Googledocs which is why I went with it. It’s working well so far.